Here’s a peak at the work of Rhonda Neufled and Rodney Konopaki, who recently showed their work at the Vernon Public Art Gallery. If you missed the show, then you’re in luck, as a different show of their work “Chance Operations” is currently up at the Penticton Art Gallery. For most traditional visual artists, the process of making art is a solitary affair. So, it is intriguing to see what happens when one artist suggests to another “let’s make art together.” Rodney Konopaki and Rhonda Neufeld began in 2007 to collaborate with both drawing and printmaking. They were drawn to work together out of a curiosity of what would happen if their two artistic practices co-mingled. 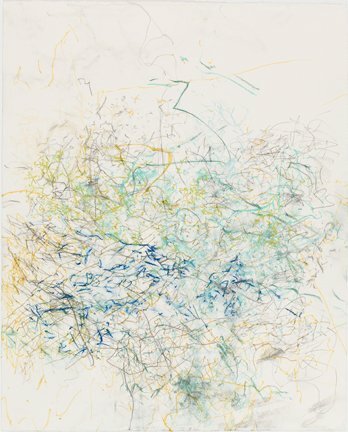 At first glance, the 20 drawings and prints in the exhibition appear to be amorphous clouds of random drawn marks; the titles of the work reading somewhat like diary entries: June 7, 2010 – A Walk to the Rooms in the Rain and Mr. Peterson’s Backyard. 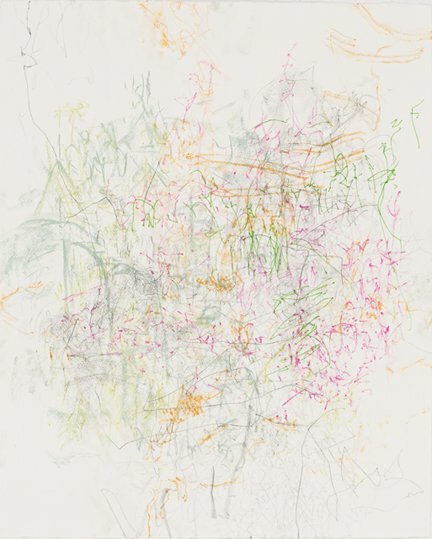 These titles reflect in part how the drawings were made; Konopaki and Neufeld walking along a cobblestone walkway or up a grassy hill carrying a drawing board or metal printing plate between them, both drawing all the while. Their concentration is split between navigating the space they walk through and what is being born on the page. Knowing this helps one better understand the atmospheric clouds of scratchy, loose, gestural, blind contour lines in each work. The art is not about rendering their surroundings visible through representation of place – St. John’s and Winnipeg to be specific. 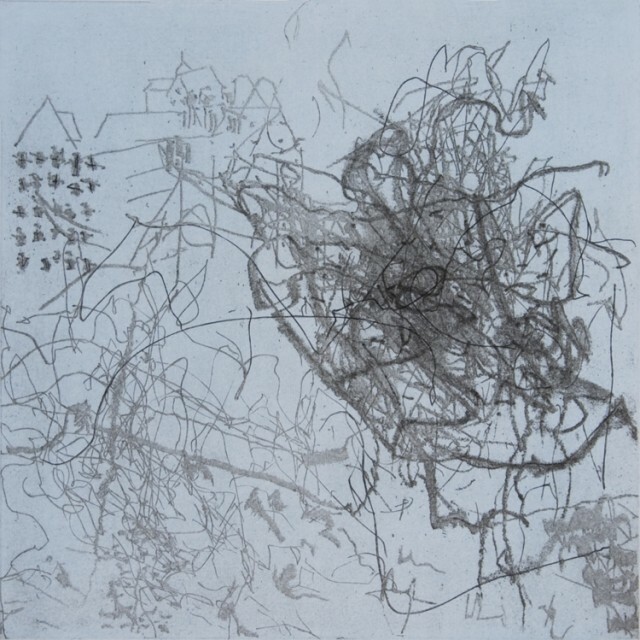 Rather, the work reflects the artists’ experience of these places – each bump and jostle of the board represented by a jog in a line here and a stray scribble there. Knowing the process helps the viewer understand the speed and freeness expressed in the lines. There are few drawn out moments or pauses in the tempo of the marks – unless you count the white of the page. The ground provides a space for the marks to play within. It both contains and expands as the marks dictate, giving room for more depth in some areas and a suggestion of wide open space in others. In June 11, 2010 – Drawn at Cape Spear, there is even a sense the page could expand infinitely into the distance accommodating yet more layers of marks. It’s interesting to note the slight differences in the quality of line between the drawings and the intaglio prints. The light graphite and conté in the drawings fade in and out of prominence, whereas the graphite and conté marks when transcribed into a print, such as in 9 Bonaventure Ave, gain sharpness, articulating themselves more clearly while still maintaining a softness. The single colour used for all the lines in this piece creates equality between the marks, so your attention is not drawn to one aspect more than any other. Even in prints like The Rooms, which use more than one colour, marks feel like they were all created simultaneously. Could one identify these works are the result of a collaboration between two artists if they were not aware of the process? The artists describe in the exhibition catalogue text how a third artist was born as a result of the collaboration. I pleasantly couldn’t tell who did what.